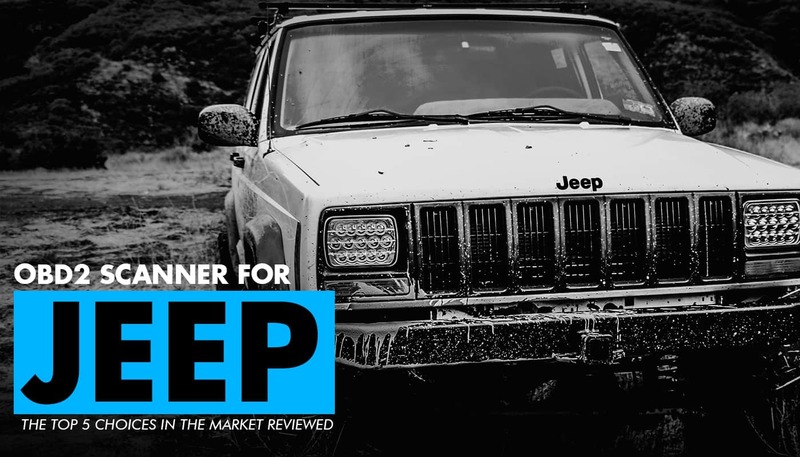 Do you need an OBD2 Scanner for your Jeep? Well, if this is the case, here we have 3 really nice options for you to take a closer look at. While the Autel MaxiDAS DS808 is quite expensive, it’s one of the most advanced aftermarket scanners out there right now. What is interesting to note is that the Autel Maxidas DS808 works for over 80 different car brands worldwide, and this includes Asian, European, and North American cars from 1996 to 2017. What is also neat is that this scanner comes with automatic software updates which it performs on its own. The Autel MaxiDAS DS808 has a smart auto VIN function, an oil reset service, TPMS programming, EPB service, DPF regeneration, SAS calibration, ABS service, SRS service, and a whole lot more. The bottom line is that this is one of the most useful, highly functional, and versatile scanners out there right now. The fact of the matter is that the Autel MaxiDAS DS808 can perform pretty much any function you would ever need when doing DIY car diagnostics. The Autel Maxidas DS808 is quite expensive and it is fairly hard to understand and get the hang of all of the functions and acronyms. The Innova 3160g is a fairly versatile, pretty simple to understand, and moderately priced car scanner. The Innova 3160g has the ability to stream and record real-time data which can be viewed later on the display itself, or you can transfer the data over to your computer. It features an alright display that is pretty easy to read, plus being handheld makes it convenient. The Innova 3160g will work for most domestic and foreign cars made between 1996 and 2017. It has the ability to read and erase SRS and ABS codes, to read, check, and clear engine lights, reset oil service lights, reset the battery maintenance light, and a few other things too. The good part about the Innova 3160g is that it has a pretty good display, it doesn’t cost too much, and has quite a few useful functions. The problem with the Innova 3160g is that the software can suffer from glitches. Also, it seems to have issues with certain brand names. One of the best parts about the BlueDriver Bluetooth is of course that it is wireless and can function with both Apple and Android phones. What is also cool is that the app is free, plus it comes with free service and updates too. The BlueDriver Bluetooth has the ability to read and clear all kinds of codes including CEL codes and enhanced codes such as ABS, SRS, transmission, and more. It can also do a smog check, as well other tests, it can display multiple PIDs as a graph, gauge, or normal readout, and it can also take a vehicle snapshot when a code is stored. The good part about the BlueDriver Bluetooth is that it works with all Apple and Android devices, it’s fairly simple to use, and it can read a whole list of dtc codes. The bad part about the BlueDriver Bluetooth is that it’s not too durable, it doesn’t come with its own screen, and the Bluetooth connection can be a bit shoddy. In our opinion, while the Autel MaxiDAS DS808 is a bit expensive, it is by far the most reliable and versatile scanner to go with. With that being said, if you want something a little simpler and more affordable, the Bluedriver Bluetooth is also a nice option to keep in mind.